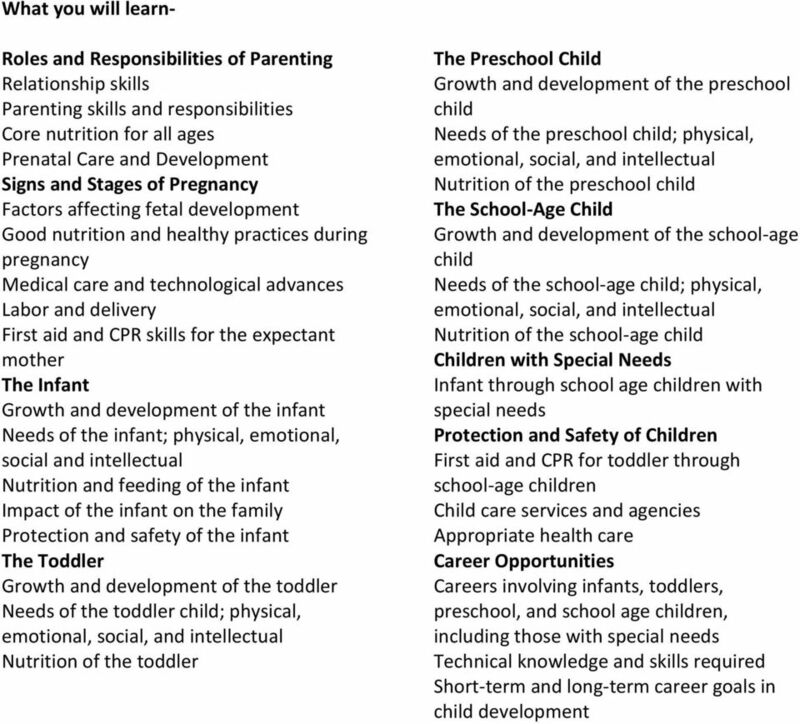 Download "Mrs. Kirklin s Child Development Class 2012-2013 Rules, Procedures, and General Information"
1 Mrs. Kirklin s Child Development Class Rules, Procedures, and General Information I. Introduction a. Rules and procedures are fundamental in life! We follow rules and procedures in our daily lives. 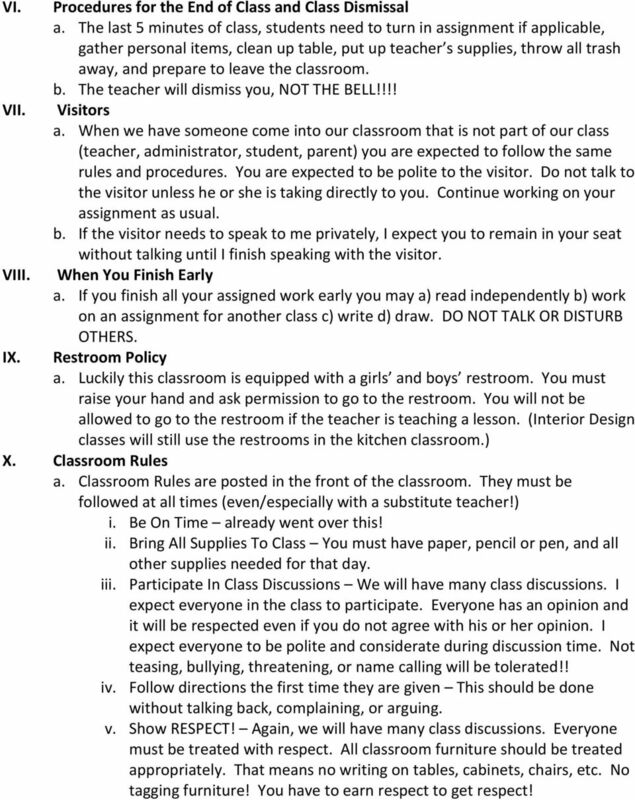 There are also rules and procedures in this classroom. These rules and procedures ensure a positive atmosphere in the classroom. They contribute to a controlled and learning environment for everyone. II. 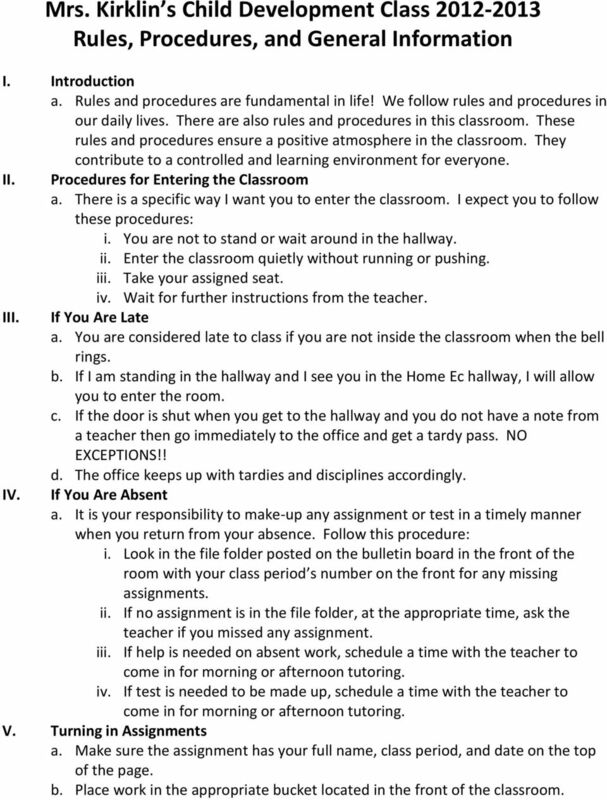 Procedures for Entering the Classroom a. 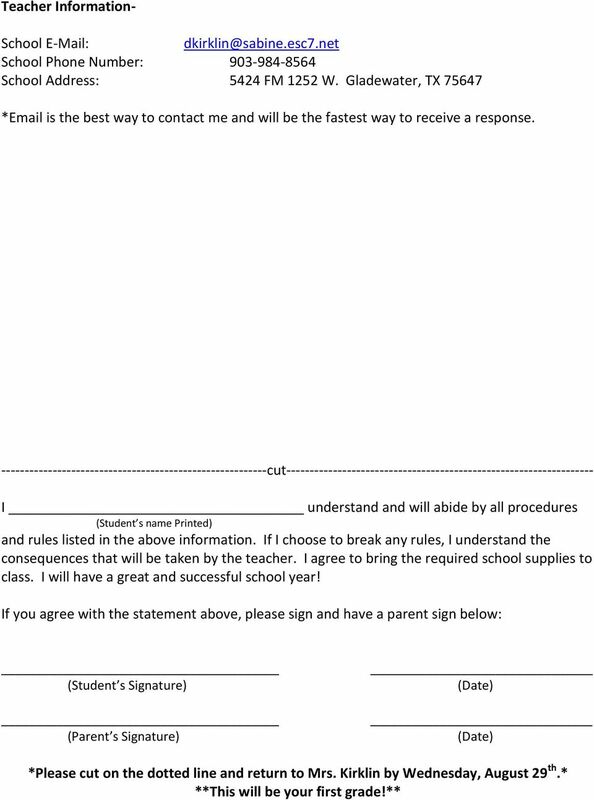 There is a specific way I want you to enter the classroom. I expect you to follow these procedures: i. You are not to stand or wait around in the hallway. ii. Enter the classroom quietly without running or pushing. iii. Take your assigned seat. iv. Wait for further instructions from the teacher. III. If You Are Late a. You are considered late to class if you are not inside the classroom when the bell rings. b. If I am standing in the hallway and I see you in the Home Ec hallway, I will allow you to enter the room. c. If the door is shut when you get to the hallway and you do not have a note from a teacher then go immediately to the office and get a tardy pass. NO EXCEPTIONS!! d. The office keeps up with tardies and disciplines accordingly. IV. If You Are Absent a. It is your responsibility to make-up any assignment or test in a timely manner when you return from your absence. Follow this procedure: i. Look in the file folder posted on the bulletin board in the front of the room with your class period s number on the front for any missing assignments. ii. If no assignment is in the file folder, at the appropriate time, ask the teacher if you missed any assignment. iii. If help is needed on absent work, schedule a time with the teacher to come in for morning or afternoon tutoring. iv. If test is needed to be made up, schedule a time with the teacher to come in for morning or afternoon tutoring. V. Turning in Assignments a. Make sure the assignment has your full name, class period, and date on the top of the page. b. Place work in the appropriate bucket located in the front of the classroom. 2 VI. VII. VIII. IX. 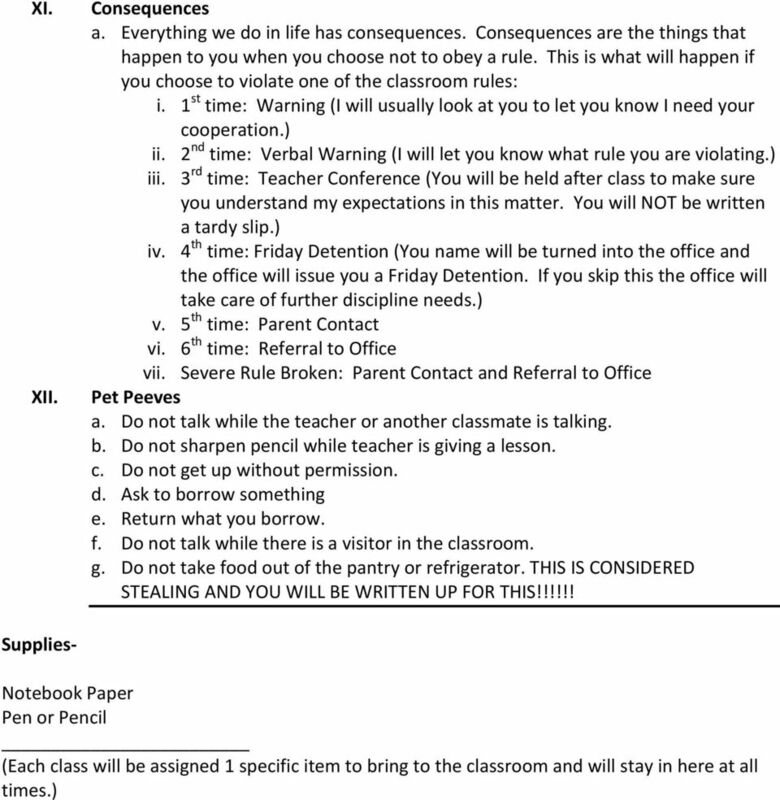 Procedures for the End of Class and Class Dismissal a. The last 5 minutes of class, students need to turn in assignment if applicable, gather personal items, clean up table, put up teacher s supplies, throw all trash away, and prepare to leave the classroom. b. The teacher will dismiss you, NOT THE BELL!!!! Visitors a. When we have someone come into our classroom that is not part of our class (teacher, administrator, student, parent) you are expected to follow the same rules and procedures. You are expected to be polite to the visitor. Do not talk to the visitor unless he or she is taking directly to you. Continue working on your assignment as usual. b. If the visitor needs to speak to me privately, I expect you to remain in your seat without talking until I finish speaking with the visitor. When You Finish Early a. If you finish all your assigned work early you may a) read independently b) work on an assignment for another class c) write d) draw. DO NOT TALK OR DISTURB OTHERS. Restroom Policy a. Luckily this classroom is equipped with a girls and boys restroom. You must raise your hand and ask permission to go to the restroom. You will not be allowed to go to the restroom if the teacher is teaching a lesson. (Interior Design classes will still use the restrooms in the kitchen classroom.) X. Classroom Rules a. Classroom Rules are posted in the front of the classroom. They must be followed at all times (even/especially with a substitute teacher!) i. Be On Time already went over this! ii. Bring All Supplies To Class You must have paper, pencil or pen, and all other supplies needed for that day. iii. Participate In Class Discussions We will have many class discussions. I expect everyone in the class to participate. Everyone has an opinion and it will be respected even if you do not agree with his or her opinion. I expect everyone to be polite and considerate during discussion time. Not teasing, bullying, threatening, or name calling will be tolerated!! iv. Follow directions the first time they are given This should be done without talking back, complaining, or arguing. v. Show RESPECT! Again, we will have many class discussions. Everyone must be treated with respect. All classroom furniture should be treated appropriately. That means no writing on tables, cabinets, chairs, etc. No tagging furniture! You have to earn respect to get respect! WHAT CAN PARENTS DO IF THEIR CHILD IS NOT MAKING GOOD PROGRESS OR IS FAILING IN SCHOOL? Staffing at the Child Care Center by Lori Harris You are nearing the end of a really promising interview for the lead teacher position in your infant/toddler program and you ask if there are any questions.